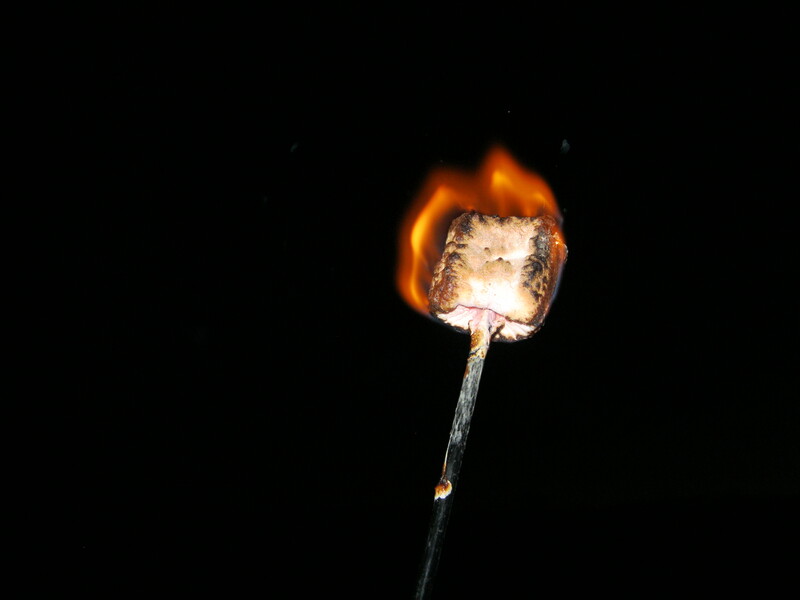 But the best way, and the only way I know, is to start along typical marshmallow toasting procedures, and then bang a hard left, into heavy roasting. Most marshmallow roasters hold up as their paradigm a uniformly dun-colored surface neatly containing a roiling mass of fluff. Recreating this paradigm requires slow and methodical rotation in the flames’ gentler reaches. A skinned cat, on the other hand, is thrust immediately into the belly of the fire, until its entirety is engulfed in flames, like a torch. The engulfment happens in seconds, thanks to all that sugar, at which point you remove the torch, extinguish it with vigorous huffing, and then, carefully, delicately, use your teeth to separate the alternately charred and blistered exterior (the skin) from a still-firm interior (the cat). The skin tastes like what it is: sweet, sticky ash, smokey and crumbly and honestly, kinda elemental. Once you’ve gulped it down, you stick the cat back in the fire and attempt to repeat the process. My mother claims to have skinned one cat four times, though none of us kids were there to witness it. For the holiday weekend, we rented a cottage in the Catskills, a ways up a small road in the mountain smidge of Chichester. The cottage was damp as a cave, and like a cave, dark at all hours of the day, but it had access to a pretty stretch of the Esopus Creek, which meanders through the Catskills like an intestine, and a sunny back lawn and a fire pit, in which, after an hour’s struggling with wet wood, I skinned three cats, and ate the graham crackers a la carte. As far as ways to celebrate our nation’s independence go, eating food you’ve roasted outdoors over a fire you’ve built yourself isn’t half bad (even if, okay, other members of your group were more instrumental to creating the fire and procuring the foodstuffs, ahem).